People born in November are lucky as they have the choice of two sparkling gems as their birthstone! Topaz comes in many colours including yellow, blue and pink and it can also be clear. It's a comparatively hard stone and was traditionally associated with protection and healing. Here, at The Earring Collection, we have an extensive selection of topaz jewellery that would make wonderful gifts. 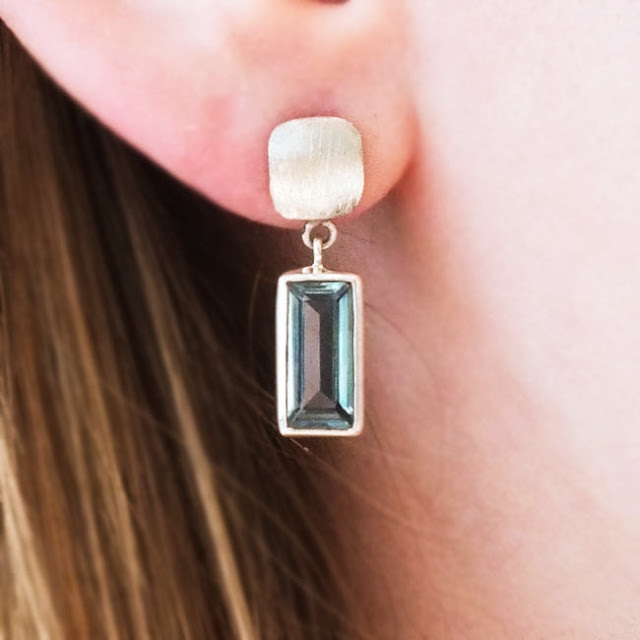 These hand-made earrings comprise of a lovely baguette cut sky blue topaz suspended beneath a brushed silver stud. Beautiful blue topaz set in hallmarked sterling silver. These beautiful statement earrings feature pink topaz and rubies set in solid sterling silver. We also have a range of stunning citrine jewellery, including the fabulous and unique necklace below. This wonderful hand made citrine necklace is completely unique. The name 'citrine' is derived from the French word for 'lemon'. The stone was carried in ancient times as protection against venom and evil thoughts. and its "sunshine" colour makes it a wonderful remedy for the grey days of November soon to come.